I’ve so far taken a slightly haphazard approach to logging IBA projects (see original IBA post here), but have now begun the legwork of getting as many books as I could carry from the Berlin TU library and collating a database. I’ve made two separate lists, Neubau and Altbau, and will gradually migrate the links and other info from my old post. The separate pages for individual projects will remain and be expanded. b) I’m a nerd, and us nerds are only ever happy when we have a vast list-based project to be getting on with. I started a Flickr group here, should anyone want to add pages. I also came across some images I tool in 2012 of the IBA retrospective exhibition at the TU, here. 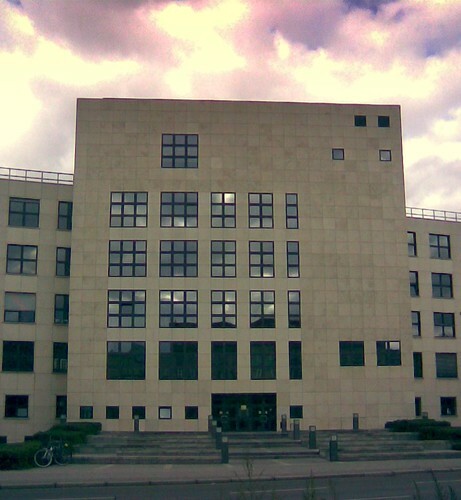 By way of overview, the International Bauaustelling (IBA) 1987 was divided into Neubau (new building) under Josef Paul Kleihues and Altbau (yes, old building) under Hardt-Waltherr Hämer. 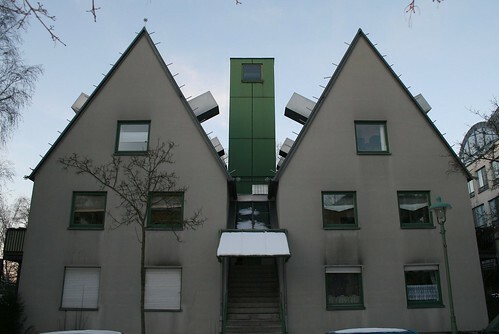 The nomenclature is not strict however; ‘Altbau’ projects, mainly in the eastern Kreuzberg district known as SO36, have many elements of newbuild, but usually integrated into existing street blocks. 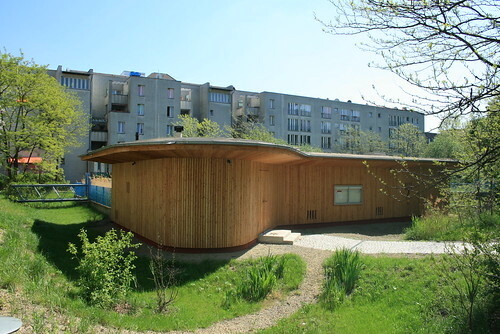 ‘Neubau’ generally applies to the larger scale freestanding construction. 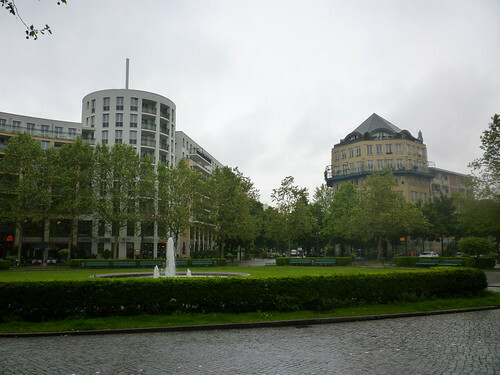 The Neubau projects were in four geographical areas; Southern Tiergarten/South Friedrichstadt (the vast majority), Prager Platz, and Tegel Harbour. I’ve listed the projects firstly by their ‘Block number’, which I assume was an allocation system of the IBA’s. 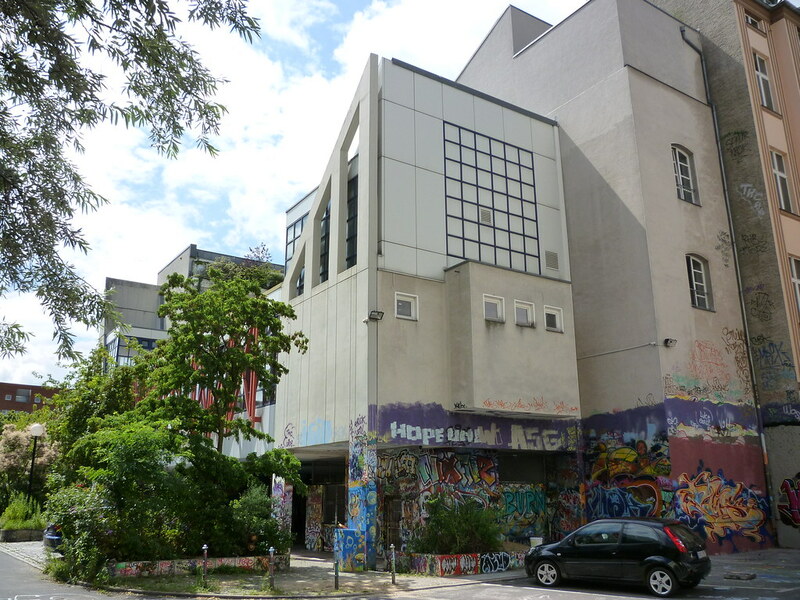 Block 1, between Kothener strasse, Bernberger Strasse and Dessauer Strasse. Perhaps its most notable building is O M Ungers contribution, which I’ve written a bit about here. 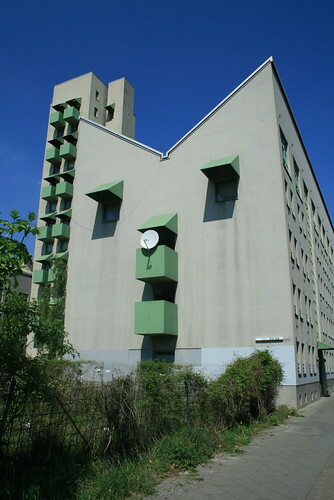 The block also includes designs by Hans C Müller and Moritz Müller, also on Dessauer Strasse. 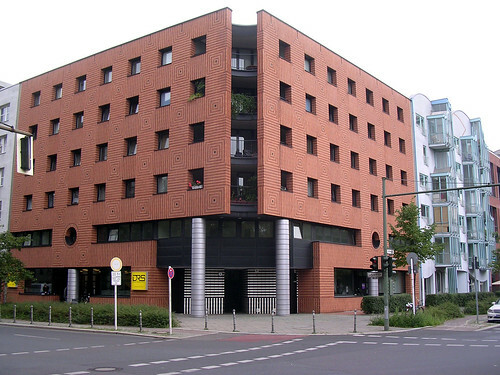 Block 2, on Dessauer Srasse 34-40, Stresemannstrasse 105-109, Bernberger Strasse 6-9. 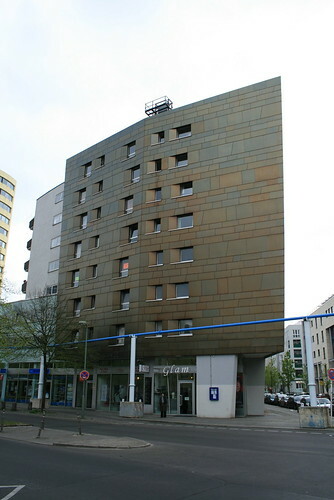 Most notable for Zaha Hadid’s residential building on Dessauer Strasse, page here. Block 3, on Wilhelmstrasse. This is actually the Topography of Terror site, and must have become part of the IBA simply because its design competition was concurrent. The competition scheme in question was not the current one, or even its aborted-during-construction Peter Zumthor predecessor, but a ‘grid of trees’ design by Wenzel, Lang. 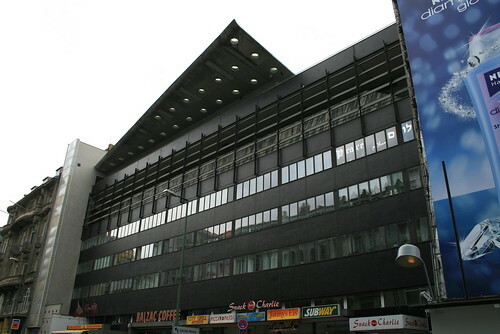 Block 4, bounded by Kochstrasse, Wilhelmstrasse, Zimmerstrasse and Friedrichstrasse. It includes Rem Koolhaas/OMA’s block on Friedrichstrasse (see pages here and here) and, in my opinion, the most impressive enclosed courtyard of the whole Neubau programme (see page here), and which includes some good work by Catalan architects MBM (see 2nd image below). The OMA block was greatly altered since writing the originally post, alterations covered here. Block 5 – a corner block on Kochstrasse 59 / Charlottenstrasse 83, by Hans Kammerer and Walter Kucher, blogged here. 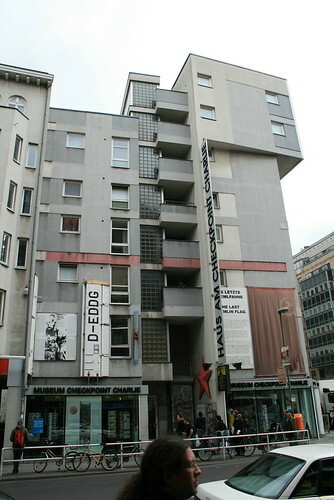 The block also includes Peter Eisenmann’s Haus am Checkpoint Charlie, covered here. 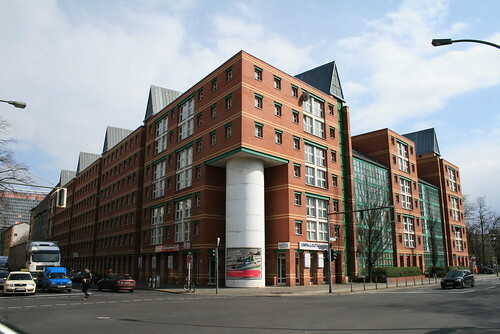 Block 6, bounded by Dessauer Strasse and Bernberger Strasse. Notable because of its unusual biological water waste disposal system – some images and comments here. 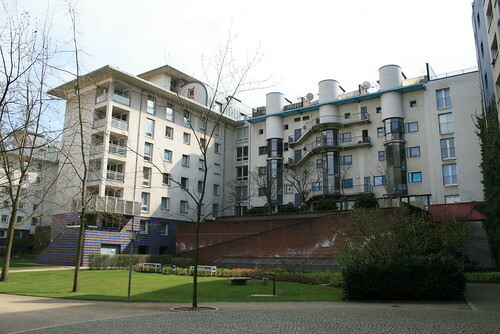 Block 9, on Wilhelmstrasse, notable for two quite prominent residential towers. Don’t get too excited. Some images here. 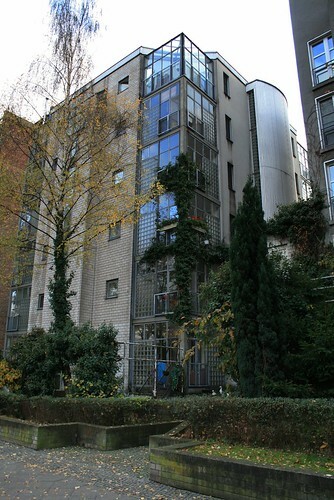 Block 11 – Charlottenstrasse 96-98, by John Hedjuk. A tower and two separate wings, oft photographed as one of Berlin’s architectural oddities. My original, rather lukewarm post here. Subsequently, my interest in the building triggered a campaign to save it from some major alterations, the campaign ran on this and other blogs, eventually reaching the press – first, second, third, fourth, fifth, sixth, seventh, eighth and finally, success! Block 24. A lesser known incorporation of some earlier buildings as the “Alte Feuerwache” (old fire station). 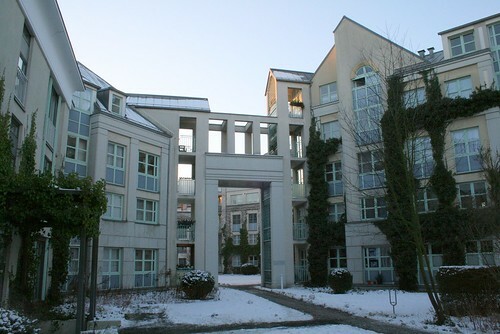 Blocks 28 & 31, known as ‘Ritterstrasse North’. Planned by, and including buildings by, Rob Krier. Post here, in which I may have confused things by indicating that ‘Ritterstrasse South’ is something separate from Block 33 (see below). Am now not sure, but it doesn’t really matter – have a wander round the whole area, as it’s interesting, and also you could make a field trip of the whole area, taking in the Jewish Museum itself, as well as Hermann Hertzberger’s Block 30 on the other side of Lindenstrasse, and Erich Mendelsohn’s I G Metall (Metalworkers union building) to the south. 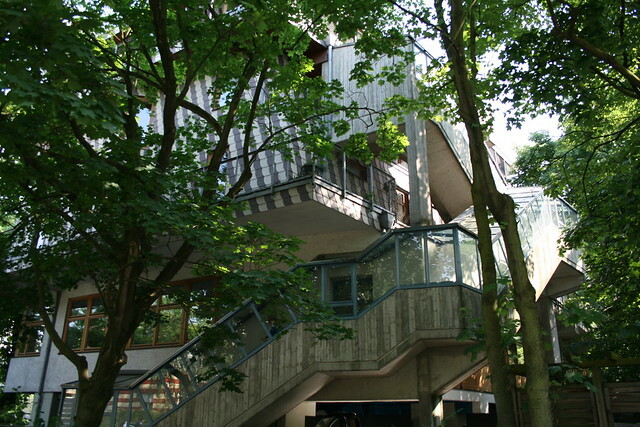 Block 33 – Residential Park ‘Am Berlin Museum’. This is the southern end of a complex next to the Jewish Museum, between Lindenstrasse (15-19) and Alte Jakobstrasse (129-136). See post here. 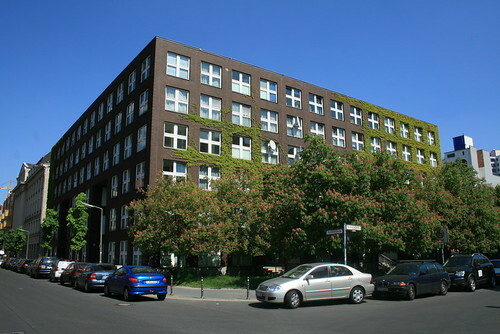 Block 189 – Known as ‘Rauchstrasse’, bounded by Thomas-Dehler-Strasse, Drakestrasse, Stulerstrsse and Rauchstrasse. Masterplan of whole block by Rob Krier. Separate page here for this. Block 192 – Rauchstrasse 21 and Corneliusstrasse 11/12 A less written-about IBA project comprising three ‘eco-houses’, by teams led by Frei Otto. Essentially open concrete frames where elements could be added, including gardens, at different floor levels. At least this was the design idea in the catalogue at the time – the realised buildings appear more substantial. Some related material here. Blocks 197 & 198 – The Japanese & Italian Embassies During the Cold War years, the Embassy district lay largely abandoned, falling as it did in West Berlin, which was no longer the capital city. The Italian Embassy was reworked as a cultural centre by Paolo Portoghesi. Nowadays of course, it’s the Italian Embassy again. 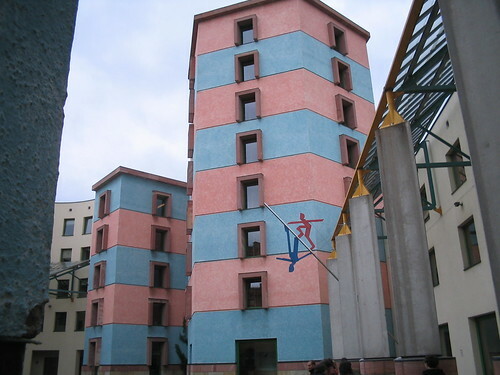 Block 204 – the ‘Wissenschaftszentrum’ (Science centre) by James Stirling and Michael Wilford The project greatly extended an existing building on Reichpietschufer. Block 220 – on the western side of Lützowplatz, by O M Ungers My post about this building here. Post blog note: as at July 2009, the front block (pictured) remains, only the rear blocks demolished. 2nd note, March 2013, completely demolished. 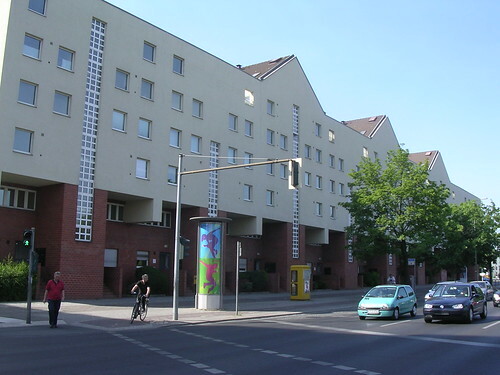 Blocks 227 & 228 – Housing “Am Karlsbad”, Potsdamer Strasse 41-49, Bissingzeile 1-3, Am Karlsbad 1. By Jürgen Sawade, Hilmer & Sattler, and others. These buildings don’t do much for me, to be honest, and I’ve whinged about them in a post here. It’s the bit at the end. Block 234 – a huge area with one side facing onto Lützowplatz. This includes a corner building on Lützowplatz by Mario Botta, with some flats by Peter Cook & Christine Hawley (he of Archigram fame) next door. A whole page, of stuff here, including Max & Karl Dudler’s rather fabulous electricity transformer station at Lützowstrasse 18. (thanks to IsarSteve from whom I’ve linked a Flickr image here). 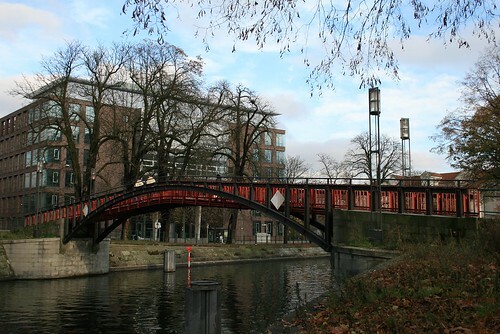 Next… Sites along the south side of the canal, including a footbridge by Brenner & Tonon, and on the south side of the river, and a row of four fascinating townhouses, by Schiedhelm, Klipper & Partner; Pysall, Jensen & Stahrenberg; von Gerkan, Marg & Partner, and the fourth which I seem to have forgotten to name. Block 608 – Family Court Building by O.M. Ungers, Hallesches Ufer 66-62. My post here. Block 622 – The Jewish Museum. Not sure to what extent the IBA claimed this as under its jurisdiction, as not relly a part of the programme as such, and is an extension of what was originally the Berlin Museum. Block 647 – on the north side of Lützowstrasse from Block 234. Includes an interesting child daycare centre and apartments and individual houses arranged in a rare (for Berlin) mews plan. Pages here and a less interesting bit at the end of this post. Prager Platz – The recreation of a square and surrounding buildings, mainly by Rob Krier, written about here. Tegeler Hafen – There was also a fairly major development out at Tegel, built around the harbour, which I’ve blogged about here, with work including all sorts of Charles Moore scary stuff, as well as another of the three John Hejduk projects that are a part of the IBA, the “House for two brothers” (below). A more recent post also, visiting Gustav Peichl’s phosphate treatment plant at the same location. Much more exciting than that sounds. this blog is great! i´m an architect going to visit berlin for the first time in 12 years and you´ve given me some great ideas for buildings to visit, as well as leads on projects i´ve never heard of. thanks so much! Does anyone know the significance of the cat statue and rat frieze on the doorway to 46 Charlottenstrasse in Berlin – or anything about its origin? I was there recently and this caught my eye but I was unable to find any information. I can’t thank you enough for finding this info and photo! Forgot to ask – does anyone know what this building is now? The corner business is a TUI travel agency but they weren’t too helpful. What does the doorway lead too. I should have tried to go i when I was there.